Just like technology, the world of web design is ever dynamic. Day after day, new trends continue to spring up. Today, designing a website is more than just combine pictures. From responsive website with device compatibility to high-quality images, etc., all these and much more constitutes a modern web design that will not only be enticing to visitor, customers, and users but also showcase the uniqueness of your brand. With all these in mind, it becomes a necessity to include certain elements in every web design project to help achieve the purpose the website was created for. In this post, we will be taking a look at some of the important elements that ought to be included in a modern web design. One of the ways of helping or guiding customers through your website is by making use of unique, bold, and large topography. There is a wide collection of fonts your web designer can select from. As a brand, topography will make it possible for you to easily express yourself. What makes topography actually unique is the fact that it used one design trend through the website to guide readers and customers through different sections of the web page. Your topography choice also indicates suitable hints about what the brand is about. Irrespective of the type of fonts you go with, ensure that the applicability across computers and browsers is considered by your web designer. Another important element of a modern web design is making use of large and responsive images. A large image will help eliminate the concept of below and above the fold. By focusing on the image with text, you will be creating a strong and vibrant visual experience. This will be all you need to encourage readers and website visitors to scroll down and read more. In addition, ensure that images are responsive also gives users an outstanding surfing experience, notwithstanding the device used to access your website. Whether the images are background or product images, visitors will get the same experience if accessed using their laptops, desktops, tablets, or mobile devices. Furthermore, background videos also make your website unique. The aim of a background video is to entice the visitor as soon as they land on your website. The video will help in explaining the vital points about the company. This will the save visitors the stress of having to read a text. Asides that, the brain is known to process videos at a faster rate when compared with text. You can use videos that play automatically in the background to tell your brand’s story. Thus, other contents that need to explain your business will be significantly reduced. Flat design is a web design concept that eliminates the perception of three dimensions. Apart from the fact that flat designs load faster, users can easily and quickly understand the idea. Your web designer can simply add more element of depth to bring life to the web page. However, try as much as possible to be consistent all through the website. The same design must be used for your homepage, product page, etc. This will make it possible for your users to easily understand the concept of your website. Other important elements include hamburger menu, giant, high-quality product images, card designs, call-to-action buttons, social media plugins, and so forth. There you have it! The above are some of the important elements that need to be included in your web design. By putting all the above into practice, not only will they make your brand’s website unique, you will also be offering your visitors a full experience of your website. Looking to design a website? Contact us today at webVDEO. We have all it takes to offer you excellent web design services. 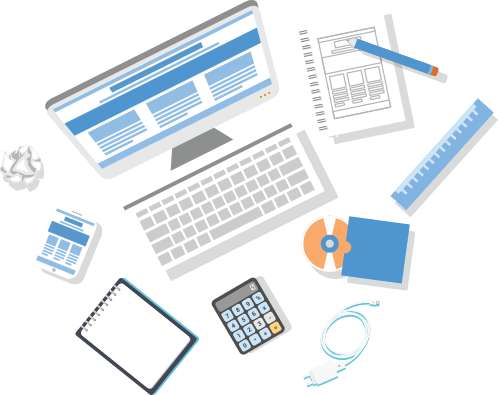 Our creative, well-experienced team of web designers are the perfect fit to get the job done. We guarantee you outstanding services.